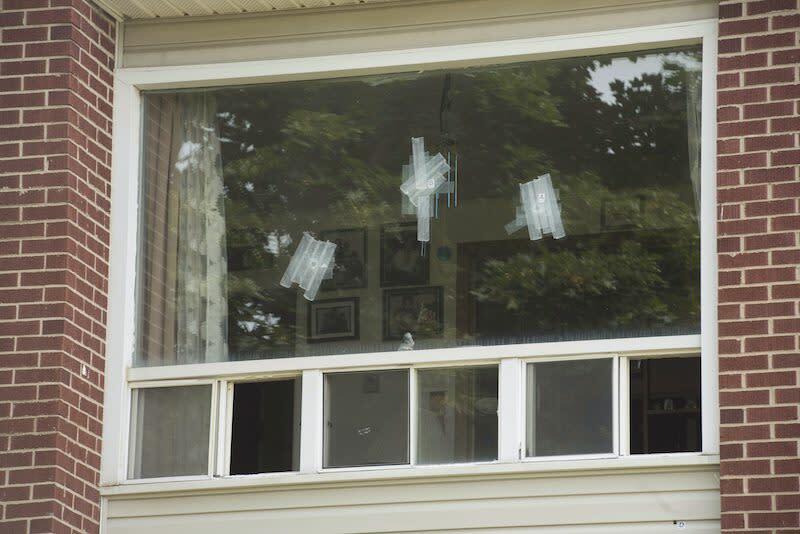 A window at an apartment building complex is riddled with bullet holes after four people died in a shooting in Fredericton on August 14, 2018. Photo from The Canadian Press. The man accused of murdering four people in Fredericton, including two police officers, tweeted often about first-person shooter video games and, four years ago, about the deaths of three Moncton Mounties during that city's shocking shootings. Matthew Vincent Raymond was active on Twitter for about four years using the username "ColtC8," also the name of a powerful, military-grade carbine. Details about the life of the 48-year-old Fredericton man have been slow to emerge, partly because he had no obvious social media or online presence. But social media and gaming accounts he created under various aliases offer insights into the online presence of a man accused of one of the highest-profile crimes in the city's history. Two days after Justin Bourque shot and killed three RCMP officers on June 4, 2014, in Moncton, N.B., Raymond tweeted his agreement with a user who said the shooter's name should not be trending on Twitter. "Yes. The slain constables and the injured ones should be for front [sic] to all this madness," Raymond wrote. He also criticized people who were tweeting the position of police officers during the hunt for Bourque. "People wake up & shut up," Raymond wrote. "Your comments could get someone killed." He described the events as a "sad couple days." Raymond's last tweet, directed at a website that reviews tactical gear, asked where he could get batons. "Seems like they are hard to find in Canada," Raymond wrote in March 2017. "Batons are hard to find for civilians," the tactical website responded. Raymond faces first-degree murder charges in the deaths of Fredericton police constables Robb Costello, 45, and Sara Burns, 43. He's also accused of shooting and killing Donnie Robichaud, 42, and Robichaud's girlfriend, Bobbie Lee Wright, 32. Police have said the long gun allegedly used in the crimes was legally obtainable in Canada and Raymond had a license to possess firearms. But officials have said little else about him. The picture that has emerged so far has many contradictions. People who know Raymond have described him both as "friendly" and "odd," with all saying he was an avid cyclist who spent a lot of time playing video games. At least two people who knew Raymond have questioned whether he was able to separate reality from the games he was playing. But millions of other people have played the same games and have not done what Raymond is alleged to have done. Raymond was active on websites where people stream videos of themselves playing video games and engage with other gamers online. All the platforms link back to a single email address, provided by an acquaintance of Raymond's. On his Microsoft Xbox account, Raymond is listed as playing about a dozen different games. Many of them revolved around racing and first-person shooting, including several iterations of Battlefield and Call of Duty. "There is my way, and the right way," Raymond's Xbox bio says. In 2013, Raymond appears to have abandoned the Xbox platform in favour of playing on a PC. He created an account on Steam, an online platform for purchasing digital video games. Raymond's bio on Steam shows he played at least 479 hours of Heroes and Generals, a first-person shooter game. He posted screenshots on his Steam account of his high scores, along with the guns and ammunition he used in the game. However, Raymond's Steam account states he has been been offline and the account dormant since April 17. That is about the same time he is reported to have moved out of his family home and into Building C at 237 Brookside Dr., where the deadly attack took place. Most of Raymond's tweets focused on gaming, sharing clips of other player's games and computer equipment he was buying. He didn't post any pictures of himself. But he occasionally weighed in on current events. Raymond posted links to online petitions for various causes, including the legalization of marijuana and the imprisonment of an Iranian woman who attended a men's volleyball game. He also tweeted his support for a petition to allow a retired U.S. police officer to keep the dog he worked with in the canine unit. In September 2014, Raymond tweeted about Peter Bryden, a Fredericton man who sustained a mysterious head injury during the Harvest Jazz and Blues Festival. Police were unable to determine whether Bryden's injuries were caused by an assault or a fall and eventually deemed the investigation to be inconclusive. Raymond described the incident as a "terrible tragedy" in his tweets. "I think it was an encounter, please report anything to help find those responsible," Raymond tweeted at CBC New Brunswick reporter Bobbi-Jean MacKinnon on Sept. 15, 2014. "It could happen to you."